We are less than two weeks away from this years annual Star Wars day (May the 4th) and no official announcement has come from Disney yet on what might be happening in or around the parks to celebrate. We do know that all Disney Stores around the US will be having a special event, but nothing has been mentioned for the usual Hollywood Studios or Downtown Disney Anaheim locations that typically carry the specially themed collectibles. 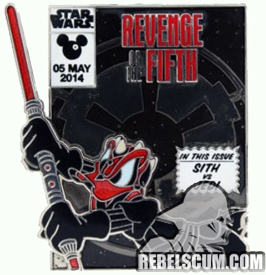 These Star Wars pins could mean that, like the last two years, there will be exclusive merchandise available on both May 4th and 5th. These images were emailed to us from an anonymous source who says the edition size will be 2,500 pieces each. 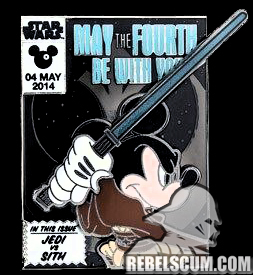 Nothing has been confirmed yet, but it certainly appears to be the real deal showing Jedi Mickey & Darth Donald popping out of a comic book cover. UPDATE: It's been confirmed, these are in fact real and will be available next month!